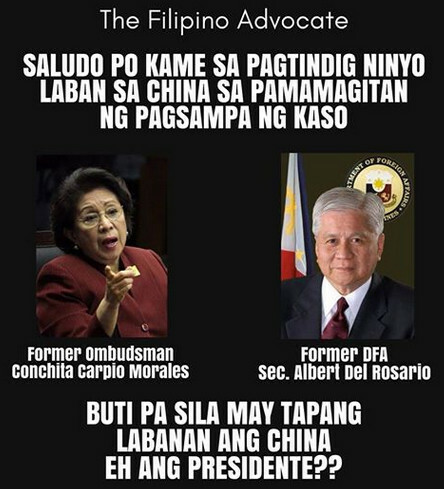 Foreign Secretary Albert del Rosario and former Ombudsman Conchita Carpio Morales filed the complaint, technically called a communication, on behalf of Filipinos and the hundreds of thousands of Filipino fishermen “persecuted and injured’’ by China’s aggressive island-building and occupation of islands in the West Philippine Sea. In implementing China’s systematic plan to take over the South China Sea, President Xi Jinping and other Chinese officials have committed crimes within the jurisdiction of the Court which involve massive, near permanent and devastating environmental damage across nations,’’ the two former officials said in a communication filed with the ICC before the Philippines withdrew from the Rome statute on March 17. “Time, however, has shown otherwise,” he added. Philippine President Rodrigo Duterte defended Xi Jinping after accusations the Chinese leader committed crimes against humanity with his country’s actions in the South China Sea, drawing a praise from China. China and the Philippines have overlapping claims over parts of the South China Sea, through which vast amounts of trade passes and which holds promising oil and natural gas reserves. Vietnam, Malaysia, Brunei and Taiwan also claim parts of the maritime area. Vietnam is also demanding compensation from China after a Chinese coastguard ship fired water cannon at Vietnamese fishermen near Paracel Islands on March 6, eventually sinking the vessel, according to a report by Vietnam News. China’s Foreign Ministry said that the Vietnamese boat was already sinking when the incident happened. China also urged Vietnam to stop “illegal” fishing. Manila won an arbitration case against Beijing in July 2016 which nullified China’s expansive claims over the sea. But Duterte has set the ruling aside, opting to forge closer ties with China and tap its loans for infrastructure projects. to be honest, i don't know if they have the right to file a case . but good on them. sana may merit yung case nila. MANILA, Philippines — Chinese President Xi Jinping supposedly committed a crime within Philippine territory, putting him under the jurisdiction of the International Criminal Court (ICC). Former Ombudsman Conchita Carpio Morales stressed this on Friday to defend the complaint they recently filed before the ICC against China’s “atrocious actions” in the South China Sea. Morales and former Foreign Affairs Secretary Albert del Rosario filed the complaint, technically called a communication, on behalf Filipino fishermen who were “persecuted and injured” by China’s aggressive island-building and occupation in the West Philippine Sea. “The one who committed the crime does not have to belong to a country who is a state party to the ICC,” Morales said in a press briefing. 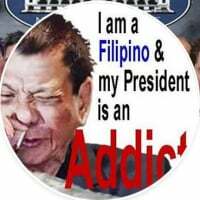 Panelo manloloko at campo ni president lying? Sinabi na nga sa Contrata na in arbitration, sa Chinese court paguusapan at de desisyunan, na kung di mag aagree sa third decision maker, Chinese ang pipili, iginigiit pang kesyo hindi mangyayaring mapasa China ang Red Bank or what ever she chooses. Marunong ba silang umintindi? O malinaw na panloloko ng harap harapan? How? Consider pushing the Philippines in a protracted war – civil or against other countries, or by ruining her economy in any destructive way. War against Malaysia, Indonesia, Vietnam or Brunie. China will defend the President, right? The contract is basically a mortgage. It is not in the box mortgage wording in the Philippines because of a number of reasons. Now, if this is a mortgage, does the President have the power to risk in a mortgage the country’s patrimony, without concurrence of Congress, or constitutional amendment? If the president does not have that power, is this a ground for impeachment? Well, impeachable offense or not, impeachment does not have a chance to prosper because of obvious reasons. Metro Manila (CNN Philippines, March 28) — President Rodrigo Duterte welcomed a ranking Chinese official during a courtesy call in Davao City Wednesday. Song Tao, Minister of the International Department of the Communist Party of China (IDCPC) Central Committee, along with other delegates from China met with the President at the Matina Enclaves. According to the Presidential Communications Operations Office (PCOO), Duterte and Song discussed "issues that would further strengthen the relationship between the two countries," as well as matters of mutual interest including the West Philippine Sea. During the meeting, the President clarified his administration had no hand in the recent filing of a case by former government officials against Chinese President Xi Jinping at the International Criminal Court. Duterte, however, clarified the Philippines is a democracy and therefore "cannot stop people from just filing cases." It was unclear how Song responded to the President's statement. No further details on the meeting have been released. 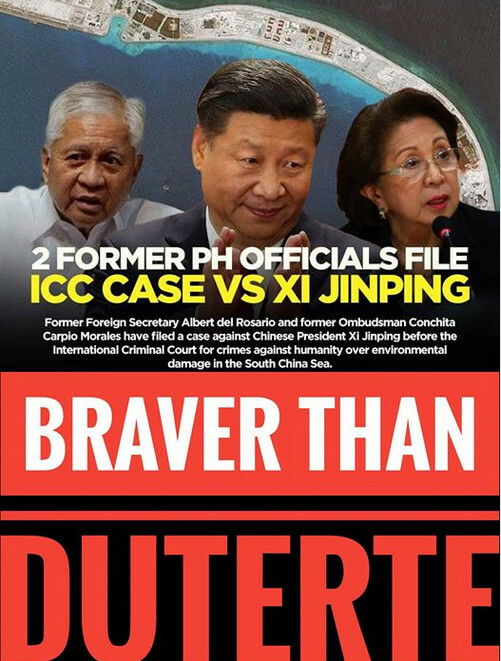 Last week, former Department of Foreign Affairs (DFA) Secretary Albert del Rosario and former Ombudsman Conchita Carpio-Morales filed a communication before the International Criminal Court outlining the crimes Chinese President Xi Jinping and other Chinese officials supposedly committed in their "systematic plan to control" the South China Sea. After learning of the filing, Duterte said both former officials were "entitled" to file the case. "They are Filipino citizens. And I think we just also have to defend our position vis-a-vis sa kanila. They think they have a good case, and I would say that there is no jurisdiction over this country and of China. Mas lalo na sa [Especially with] China. We will just go along that line," he said. However, the President added whether the case would prosper or not was a different matter. IF not for the US leaders’ pragmatism and cool-headedness, President Aquino 3rd and his foreign secretary Albert del Rosario could have dragged it into a war against China on the South China Sea, a conflict that could have even triggered a nuclear war between the two superpowers— just to cover up their bungling of the Scarborough Shoal crisis. In April 2012, Chinese civilian-government and fishing vessels went to their fishermen’s succor at Scarborough Shoal (Bajo de Masinloc or Panatag Shoal) when the Philippine Coast Guard and Bureau of Aquatic Resources accosted them for alleged illegal fishing. Aquino ordered to the shoal the Navy’s biggest warship, acquired only a year earlier, the BRP Gregorio del Pilar to board the fishermen’s vessels to take them in. That was a big boo-boo. China pounced on Aquino’s blunder by loudly protesting that the Philippines had “militarized” the dispute, and that “Philippine warships” were detaining its helpless fishermen. Cleverly, China did not respond by sending its own warships, even as several of its modern frigates were on alert stand-by just over the horizon. It instead undertook a sea-borne version of people power by having over 60 Chinese fishermen’s vessels—escorted by some six civilian government vessels—to the shoal. The Chinese and Filipinos vessels were then locked in a stand-off that lasted for about six weeks from late April to May 2012, with each party aware that whoever blinks, or withdraws from the shoal, will lose it – forever, as it were. Diplomatic sources here and abroad disclosed that Aquino and del Rosario begged the US to intervene in the conflict, by sending its warships to the area to send the message to China that it would defend the Philippines’ vessels if attacked. Del Rosario and defense secretary Voltaire Gazmin rushed to Washington, D.C. on April 30, as the crisis that started on April 10 seemed to go against the Philippines, to meet with US Secretary of State Hillary Clinton and Defense Secretary Leon Panetta. Del Rosario invoked Clinton’s statements a year earlier that the US would stand by its 1951 Mutual Defense Treaty that requires it to defend the Philippines in case of attack by any foreign power on its military forces. Clinton and even the US defense secretary did not respond to del Rosario’s demand for a categorical US commitment that it would come to the Philippines’ defense in case a shooting war breaks out in the Scarborough crisis. We were blissfully oblivious of the Scarborough stand-off when it was happening, with the Yellow newspapers here successfully toning down the crisis, helped by the fact that the burning issue of the day was Aquino’s project to take down Chief Justice Renato Corona. There was, however, a clear danger of war breaking out, as Aquino’s mishandling of the Scarborough crisis—reported in China as his deployment of “Philippine warships” against helpless Chinese fishermen—had stoked Chinese nationalist sentiment. “The leadership of the Communist Party of China would have even fallen if they appeared to be soft on the Philippines,” a diplomat said. 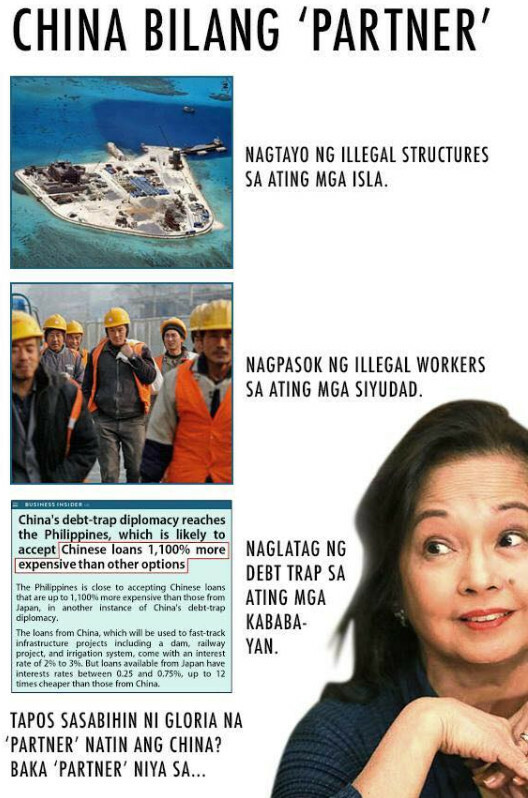 The Chinese of course got wind of del Rosario’s pleading for US military intervention, and escalated its rhetoric. On May 9, the People’s Liberation Army Daily ran a toughly worded editorial saying that China would not tolerate any violation of Chinese sovereignty on Scarborough Shoal. According to the editorial, “Not only will the Chinese government not agree, nor will the Chinese people, and the Chinese Army will disagree even more.” The flurry of threatening editorials from the PLA newspaper underscored its well-known hardline stance when it comes to territorial disputes. Unreported in the country were media reports from Taiwan and Japan that alleged that China’s South Sea Fleet had forward-deployed a landing ship flotilla and a naval task force consisting of destroyers and amphibious ships in waters off the Philippines. There were also reports that China had already ordered two submarines to stand by at international waters off Scarborough Shoal. US officials, however, rebuffed del Rosario and Gazmin’s pleadings. Clinton and Panetta were worried that the two Philippine officials kept pressing them to give a categorical answer to their question: Will the US military come to the Philippines’ rescue if one of their vessels is attacked by the Chinese? That worried the US that Aquino might order his vessels to provoke the Chinese at Scarborough Shoal, in order to get the Americans into the fray, which could have thrown he situation completely out of control, to lead into a full-blown war between two nuclear powers. That concern bolsters a narrative I discussed in my column last Friday that it was the US that hoodwinked del Rosario and Aquino into believing that there was an agreement brokered by the Americans for the Chinese to simultaneously withdraw with the Filipino vessels from Scarborough’s lagoon. There wasn’t an agreement, but merely a proposal for such, and del Rosario naively ordered our vessels out of Scarborough June 3. Aquino of course obeyed Obama. His government filed an arbitration suit invoking the law of the seas at the Permanent Court of Arbitration in Hague, with a Washington D.C. firm Foley Hoag LLP, and a special team of American lawyers recommended by the State Department handling everything. The work of then Solicitor General Florin Hilbay and his staff was limited to photocopying the US lawyers’ documents. After that, Aquino rushed the passing of the so-called “Enhanced Defense Cooperation Agreement” that allows the US to rotate troops into the country for extended stays and to operate facilities and stock up war materiel on Philippine military bases. That was one of the most important of his priority bills that Aquino asked Congress to enact. Supreme Court Senior Associate Justice Antonio Carpio on Thursday said that he was aware that China was monitoring phone calls and emails. According to a report in GMA News TV's State of the Nation with Jessica Soho, Carpio made the remark after the power went off at a convention of the Integrated Bar of the Philippines in Iloilo City. He was giving a lecture and presenting a video on China's claims in the South China Sea and the arbitral tribunal's 2016 ruling which favored the Philippines when the power outage occurred. "I knew that my email and my phone conversations are being monitored by China but I didn't know they have the capability to tinker with our video now," Carpio said. GMA News Online is trying to get word from the Chinese embassy as regards Carpio's statement. Carpio recently expressed concern over the Chico River irrigation loan agreement between the Philippines and China, saying the latter could seize oil and gas-rich Philippine assets in the West Philippine Sea (WPS) if the country would default on its payments. "In case of default by the Philippines in the repayment of the loan, China can seize, to satisfy any arbitral award in favor of China, patrimonial assets and assets dedicated to commercial use of the Philippine government," Carpio said in a presentation shared with reporters. Carpio said that this was expected to be the "template" for all other loans to the Philippines. He explained that the term "patrimonial assets and assets dedicated to commercial use" includes the oil and gas within the Philippine exclusive economic zone (EEZ) in the WPS. "This includes the rich gas fields in Reed Bank," he stressed. Palace spokesman Salvador Panelo refuted Carpio's claims and said the Reed Bank was not a patrimonial asset of the Philippines. "Hindi pupuwede yung sinasabi niya, kasi wala namang deklarasyon na yung Reed Bank is patrimonial property," he said on Tuesday. He, however, acknowledged a day after that there is a law declaring Reed Bank as such. “Meron nga, as he said and I agree, meron,” he said. Panelo on Wednesday called Carpio "unpatriotic" for pointing out the pro-China provisions in the loan agreement covering the Chico River pump irrigation project. Carpio just laughed off Panelo’s claim. Another thing I am worried about these “mortgages” is if somehow, the Chinese find ways (or planned) to accelerate collection of the loans before contracted due date, like if the Philippines declares bankruptcy. If that happens, that may be construed as inability to pay, and therefore they can pick up our patrimonial assets. Cannot happen? Remember, any dispute will be heard in China, and under Chinese jurisprudence. Me palag ba ng Pinas? Duterte explained to China that PH govt has nothing to do with ICC complaint filed vs Xi over bullying of Filipino fishermen. 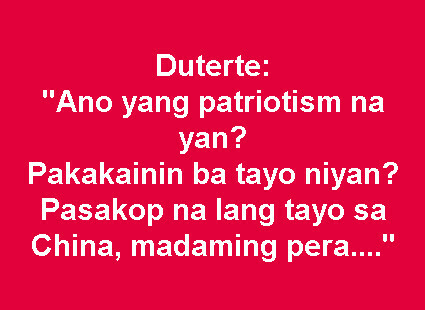 He should be explaining to the Filipino people why he has failed to voice any protest vs China over bullying of Filipino fishermen, destruction of PH reefs, and takeover of PH Sea. This is an embarassament for Winnie the Pooh! Calm down, folks. There’s really nothing wrong with the Philippine government using the country’s assets as collateral in the loans it secured from China. At least that’s what President Rodrigo Duterte’s spokesperson Salvador Panelo wants you to think. He said today that using the country’s territories as collateral is no big deal and that these are standard clauses in inter-government loan contracts. Panelo’s statement comes a few days after Supreme Court Senior Associate Justice Antonio Carpio said that China could seize the gas-rich Reed Bank in the contested West Philippine Sea if the government fails to pay off a multi-billion loan from the Asian superpower. Carpio said that the Philippine government offered any part of the country as collateral for a PHP3.69 billion Chinese loan (US$70.26 million) to fund the Chico River Pump Irrigation project, ABS-CBN News reported. Rappler reported that the loan comes with a 2 percent annual interest rate, a “management fee” worth $186,260 (PHP9.78 million), and an annual commitment fee of 0.3 percent. The loan has been described as onerous by critics of the government who warned that it was a debt trap. The project will reportedly irrigate 8,700 hectares of land in Kalinga and Cagayan. However, Carpio warned that if the Philippines fails to pay the loan, the government would end up going into arbitration at the China International Economic and Trade Arbitration Commission in Beijing, which Carpio said the Philippines will likely lose. If the Philippines does, he said China could take the disputed Reed Bank. However, Panelo, who also works as the government’s chief legal counsel, dismissed Carpio’s warning and said the Philippines can pay off its loans. “I don’t see anything wrong because I know it will never happen; that is precisely why perhaps the economic managers who entered into the contract know that it will never happen,” he was quoted by CNN Philippines saying. He also added that it was just natural for China to include a clause in the loan contract that was more favorable to them and unfavorable to the Philippines. Yes, he seriously said that. He also said that the Philippines can no longer renegotiate the terms of the contract. “When we take out a loan, do we really have a say? When we [take out a] loan from the bank, it’s always the terms of the bank. It’s just natural that they will make sure that they won’t lose out in giving that loan,” Panelo said, according to GMA News. Duterte’s government is generally perceived to have pro-China policies with the president even announcing an economic and military split from the United States, one of its oldest allies, to align himself ideologically with China. Some critics have assailed the government for this, especially because Duterte has consistently refused to enforce a 2016 ruling which invalidated China’s claim over the West Philippine Sea. MANILA, Philippines — Hitting back at presidential spokesperson Salvador Panelo's remarks on the communication submitted before the International Criminal Court, former Ombudsman Conchita Carpio-Morales said the Malacañang mouthpiece was misinformed on the matter. Panelo earlier said the submission of Morales and former Foreign Affairs Secretary Albert del Rosario asking the ICC to conduct a preliminary examination on China's massive island-building activities in the South China Sea was a "futile exercise." The communication accused Xi, Chinese Foreign Minister Wang Yi and Chinese Ambassador to the Philippines Zhao Jianhua or committing crimes "which involve massive, near-permanent and devastating environmental damage across nations." "He is misinformed or he misread, if at all he read, the Rome Statute," Morales told ANC's "Headstart" Tuesday morning. Morales stressed that the crime was committed within Philippine territory while the country was a member of the Rome Statute that established the ICC. "Whether or not the pepetrator, subject of our communication belongs to a country which is a member of the Rome Statute is immaterial because what's material is that person committed a crime within the territory of the Philippines, which is a member of the Rome Statute," Morales said. The communication against Xi and other Chinese officials was submitted days before the Philippines' withdrawal from the ICC took effect on March 17. In the communication submitted to the international court, Del Rosario and Morales argued that it has jurisdiction over the "atrociously inhumane actions" of Chinese officials in the South China Sea, which is within Philippine territory. MANILA - Most Filipinos believe that the lawsuit filed by former Philippine government officials against Chinese President Xi Jinping in the International Criminal Court (ICC) tells the world that China should leave the West Philippine Sea. 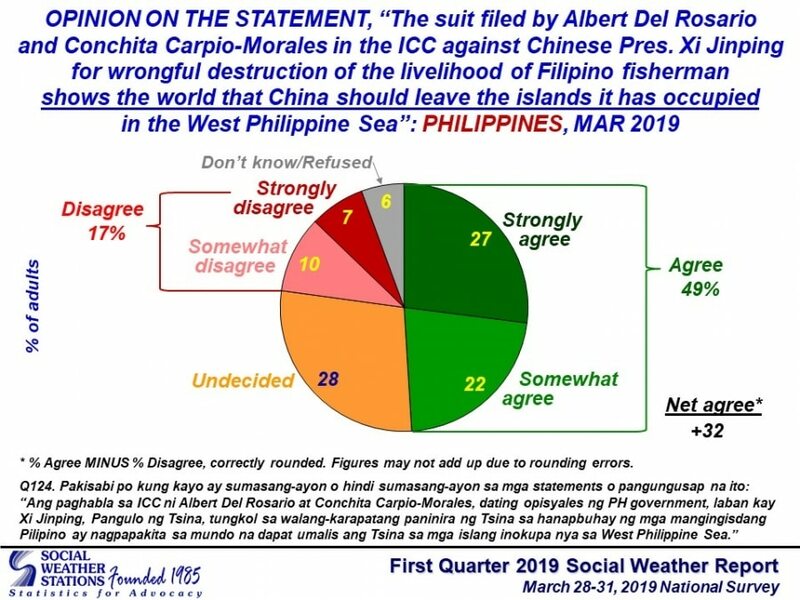 The survey, conducted in March 2019, found that 49 percent of Filipino adults agreed with the statement: "“The suit filed in the ICC by Albert Del Rosario and Conchita Carpio-Morales, former officials of the PH government, against Chinese Pres. Xi Jinping for wrongful destruction of the livelihood of Filipino fisherman shows the world that China should leave the islands it has occupied in the West Philippine Sea." Only 17 percent disagreed with the statement while 28 percent were undecided, equivalent to a net agreement score of +32, classified by SWS as "very strong." The West Philippine Sea is the country's exclusive economic zone in the disputed South China Sea, resource-rich waters which Beijing claims in near entirety citing historical rights. SWS also said net agreement to the statement is "very strong" regardless of trust or distrust to China as a country. Agreement to the statement was also "very strong" in Metro Manila and Balance Luzon, and among economic classes A, B, C, and D.
On March 13, Del Rosario, a former foreign affairs chief, Carpio-Morales, a former Ombudsman, and several Filipino fishermen affected by Chinese incursions in the contested waters filed a communication against Xi before the ICC for crimes allegedly committed in the South China Sea. It was filed just days before the Philippines' withdrawal from the ICC took effect on March 17. President Rodrigo Duterte had pulled the country out of the Rome Statute, the treaty creating the ICC, over the tribunal's probe on his deadly drug war. Malacañang has distanced itself from the complaint. It accused Xi and other Chinese officials of committing crimes against humanity in implementing Beijing's "systematic plan to control the South China Sea." China has continued militarization and island-building in the disputed waters, ignoring a July 2016 ruling of a United Nations-backed tribunal invalidating its excessive claims in the South China Sea. The ruling was in response to a complaint filed by the Philippine government in 2013, led by Del Rosario, who was then top diplomat. Conducted from Mar. 28 to 31, 2019, the SWS survey used face-to-face interviews of 1,440 adults (18 years old and above) nationwide and has a sampling error margin of ±2.6 percent for national percentages.